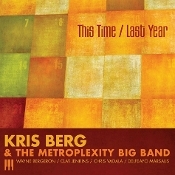 Kris's first album as a composer and band leader, This Time / Last Year features Wayne Bergeron, Delfeayo Marsalis, Clay Jenkins and Chris Valada. The Metroplexity Big Band includes the best jazz musicians north Texas has to offer. All music is by best selling composer/arranger / funkifier of the common chicken - Kris Berg. Some tunes include a new arrangement for Belwin on “Softly, As In A Morning Sunrise” (Think Elvin meets Hammerstein! ), an outrageous funk original, “Games”, the title cut, “This Time/ Last Year” (an ECM style latin chart written for the composer's wife) and, of course, something “chicken”!